On Sunday, I manage to get my kids out of the house by 10 am. We plug in our latest iPod downloads — momentary hesitation here as I question whether the “clean” version of my 8 year old’s new favorite hip hop song is really appropriate. 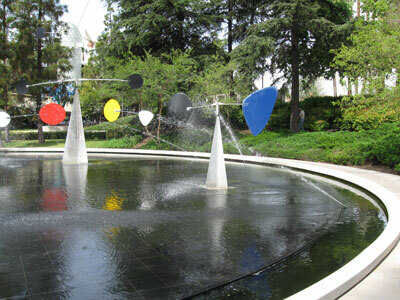 We head east for the Los Angeles County Museum of Art (LACMA) – one of my favorite art museums in Los Angeles. Our plan is to meet our friends at 10:30 am in front of the lampposts. This will give the kids plenty of time to run around before the museum opens at 11 am. 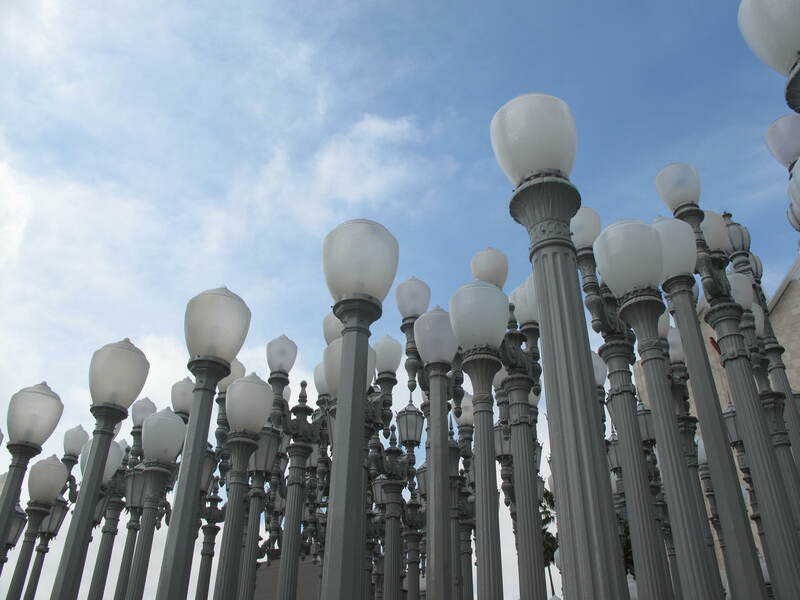 The Urban Light sculpture (learn more) by Chris Burden, made with 202 L.A. street lights, is a hit. The kids love running in and out of the lampposts together. Here’s the really cool thing about LACMA — kids are free. 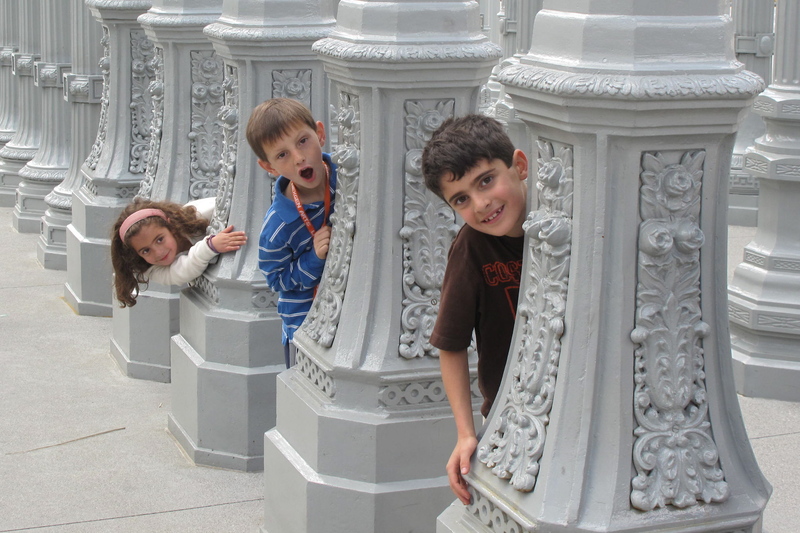 LACMA’s NexGen program gives free admission to kids under 17 and an accompanying adult. Our kids get NexGen nametags to wear around their necks — they like this a lot. Their name tags work as free passes everytime they come to the museum. 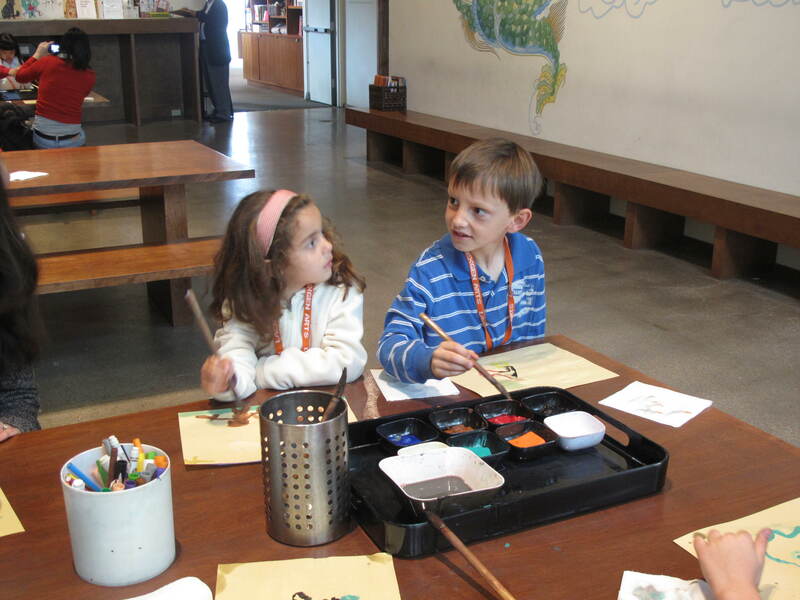 Then we head over to the Boone Children’s Gallery (learn more)– a place where kids and adults can learn how to make Korean watercolor paintings. We’re there early so we have the place to ourselves. The super friendly gallery educator gives us a quick demonstration and the kids paint to their heart’s content (and so do we). While our masterpieces are drying, we decide to grab lunch at the cafe. The museum’s Plaza Cafe is nearby — even better, the food is great. Menu highlights are gourmet pizzas baked in a hearth oven, and yummy hot Panini sandwiches. It is a little expensive (most items are around $9.50, and kids meals are $7.50-5.00). But hey, we scored free parking on the street (one of the perks of getting there early) and the tickets were free. On the way out, the kids check out Calder’s Hello Girl mobile sculpture (learn more) outside the café. There’s definitely something about these large sculptures that really captivates their attention. Then the kids run off towards the grassy knoll outside the Page Museum – La Brea Tar Pits. They start rolling wildly down the hill, laughing all the way. We tell the kids not to touch the tar puddles scattered throughout the park. But they can’t resist and do it anyway. I’m having trouble getting the tar off my son’s hands (note to self, bring wipes next time), and it seems like the kids have seen enough for today, so we head home. On our way back, I’m thinking about what a great time we had. I do, however, feel some parental guilt as I realize we never did go in the galleries. But then I think again. While the kids didn’t see any of the museum’s art collection, they did see some amazing outdoor sculptures. And best of all, it was a great experience and they want to go again.